So, sometimes I have a little bit of trouble, how would you say...'acting my age'. But sometimes you have to admit that "the kids" have some ideas well worth adopting. Hence, Orange-Black Currant Jello Shots. Vegans or kosher note: kojel works great. Lightly spray about 12 small plastic cups or paper cups with regular pam. 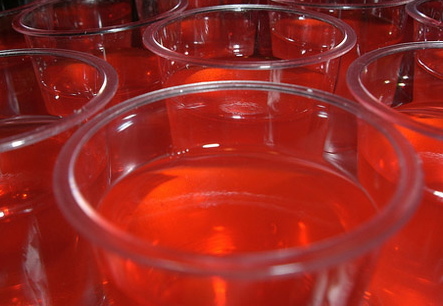 Don't worry, you won't taste it, and it helps the jello slide out. Empty jello box into a bowl. Stir in orange juice, vodka, and extract. Mix well. Pour into individual cups, and refrigerate at least four hours. Enjoy. This idea from my neice Kim is always a hit. Empty Gummy Bears into an aluminum bowl. Cover with vodka (or tequila), cover well, and allow to rest in the freezer for at least 12 hours.